Meanwhile Concord becomes, some say, the literary capital of America. 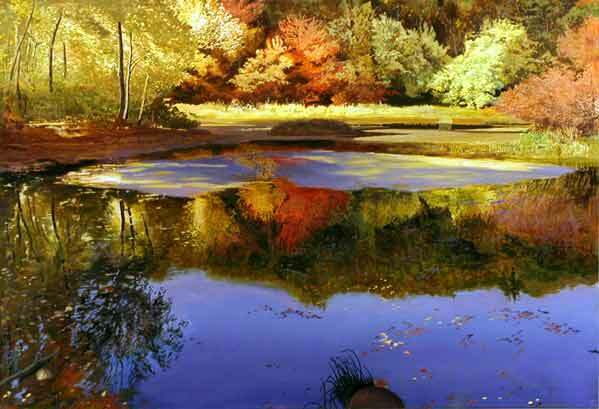 Ralph Waldo Emerson, Henry David Thoreau, Louisa May Alcott, and Nathaniel Hawthorne are the best know of many thinkers and writers in Concord. Visitors from far-off places come to discuss major issues of the day. 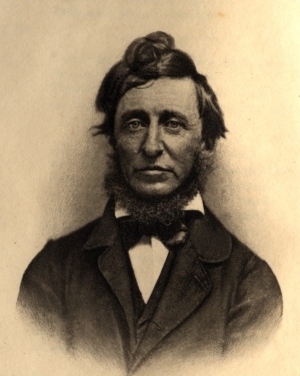 Transcendentalism develops, and the Concord School of Philosophy is built. 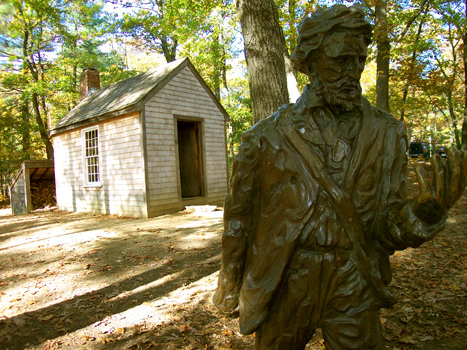 Thoreau documents the town’s natural history and geography, and briefly lives in a Walden Pond woodlot surrounded by intensive agriculture. Culture expands in academies, libraries, and lyceums. Voluntary associations proliferate. Women play major roles in town. Abolitionism is active and the underground railroad runs through Concord. Monuments in Monument Square and Sleepy Hollow Cemetery suggest the impact of the Civil War on Concord. Some evidence suggests that three structures date to the 1650’s, the Thomas Dane House (47 Lexington Rd. ), Edward Bulkeley House (92 Sudbury Rd.) and Parkman Tavern (20 Powder Mill Rd. CONCORD,MASS). Speculation continues that two rooms of the Old Block House (now at 57 Lowell Rd.) might have been the home of Rev. John Jones, a town founder and resident from 1635 to 1644. This entry was posted on November 25, 2009 at 1:29 am and is filed under Uncategorized. You can follow any responses to this entry through the RSS 2.0 feed. You can leave a response, or trackback from your own site. Hi! My name is Heather Martino – I am a historic guide at the Old Manse in Concord MA and am working on a pictorial “then and now” style book with my manager. 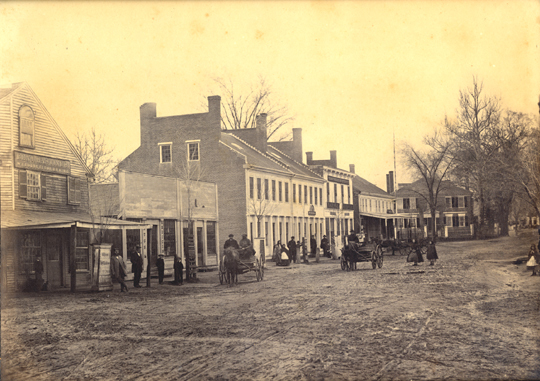 I was looking for an old image of Concord and love the image that refers to the “Jonas Hastings House”. Do you know where this came from and if there is a high resolution version of it somewhere? I have been working with the Library and other long running families that have old pictures and cannot seem to find this one you have. Warm regards! i found it after googling the subject jonas hastings house and searched images. I have moved to Camden, Maine recently and I live in a house built in 1800 by William Parkman, from Concord. I have been told he had originally been a ship’s carpenter and he built the house and the carriage house for himself and his family. He prospered here in Camden. His son William bought the house from him. Does any of this sound familiar to any of your Parkman ancestors? Be happy to hear from you. a William Parkman is in my family tree. Alexander Parkman was American Rev Leuitenant and Minuteman that had house in Westmoreland, Onieda County/Fingerlakes NY. just found a Parkman Tavern, Concord Mass. Yes, William Parkman owned Parkman Tavern in Concord, MA still in existence. 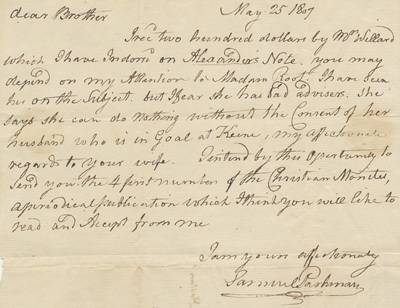 Find some of his letters , pedigree, family group and tombstone on this’d blog search .